Cuba provided an ideal arena for sparring between Moscow and Beijing. In a developing country long under the thumb of the United States, the Castro brothers’ revolution accorded perfectly with Mao’s vision of conflict between the capitalist and socialist blocs. But China lacked the military and economic power to support the Cuban Revolution; only the Soviets had the means to protect the Castro regime. Moscow and Beijing nevertheless jockeyed for support in Havana. Indeed, the Soviets may have committed to delivering missiles less out of fear of a U.S. invasion than of a Cuban shift towards the PRC. As the Cuban Missile Crisis unfolded, a Chinese critique emerged of Soviet weakness and perfidy. The eventual withdrawal of missiles, seemingly as part of a deal between the United States and the Soviet Union, demonstrated the Maoist point perfectly; the Soviet Union was willing to compromise the interests of revolution in the developing world in order to avoid conflict with the United States. Indeed, Chinese rhetoric probably pushed the United States and the USSR to treat each other more cordially than would otherwise have been the case. Combined with the short, quick victory of Chinese arms in the Sino-Indian War, the outcome of the Cuban Missile Crisis strongly supported Mao’s foreign policy argument, and consequently his position within domestic politics. Over time, Mao would capitalize on this victory to restore his pre-eminence within the Chinese Communist Party. 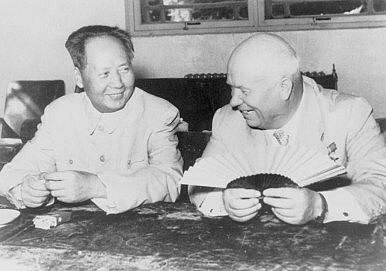 The ideological struggle driving the Sino-Soviet split stopped mattering in the end. Tolkachev, Cold War Spycraft, and Modern Risks for China5 Reasons Why China Is Not the Soviet UnionThe Enduring Relevance of America's Reckoning With the Qing DynastyThe Last Jedi and the Founding Mythology of the Chinese Communist PartyCan Trumpian Triangular Diplomacy Work?